Wanting to lift your Dodge Ram 2500 just enough in the front and rear? 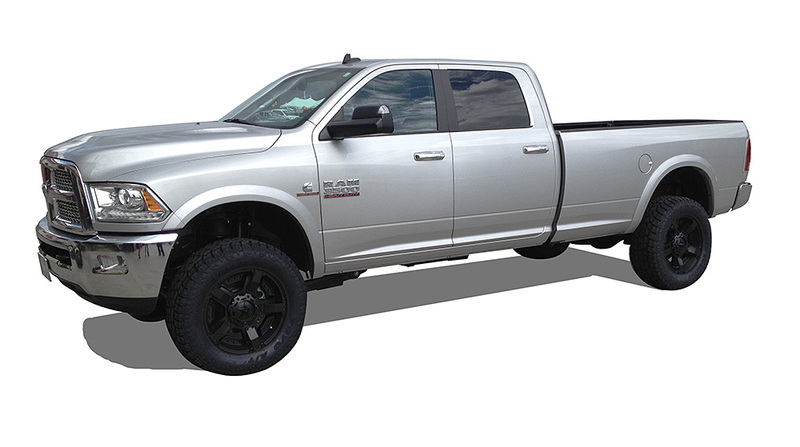 Tuff Country's Ram 2500 3" lift kit will allow for use of up to 35" tires giving additional fender clearance. 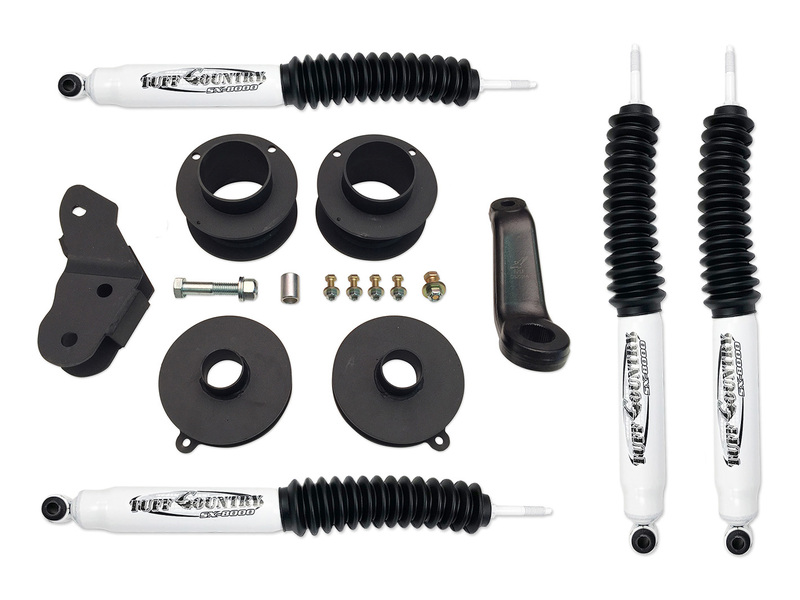 Designed using 3 inch front upper coil spring spacers and 1 inch rear coil spacers, this lift kit will raise your Ram 2500 and while maintaining a factory ride. 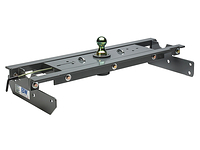 Included is also a bracket to relocate your track bar and a drop pitman arm to keep your front end in proper alignment and geometry. Note: New front extended shocks are required with this kit. 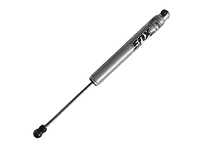 Please select part #33130, 33131KN in the options above if you do not already have a shock extension or extended shocks. 1. 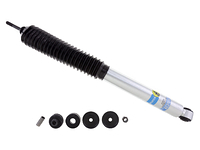 Factory length front shocks must be replaced or extended to install this lift kit properly. 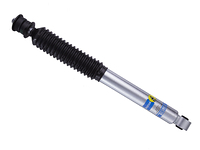 Please choose shocks & boots in the "Options" fields above if you have not already purchased extended shocks. 2. Excludes Power Wagon models & models with factory rear air suspension. Good question. Nope, bumper height will remain in proportion to the body height. Suspension lift kits will always raise the bumper the same as the body. However if this where a body lift kit that would not be the case. 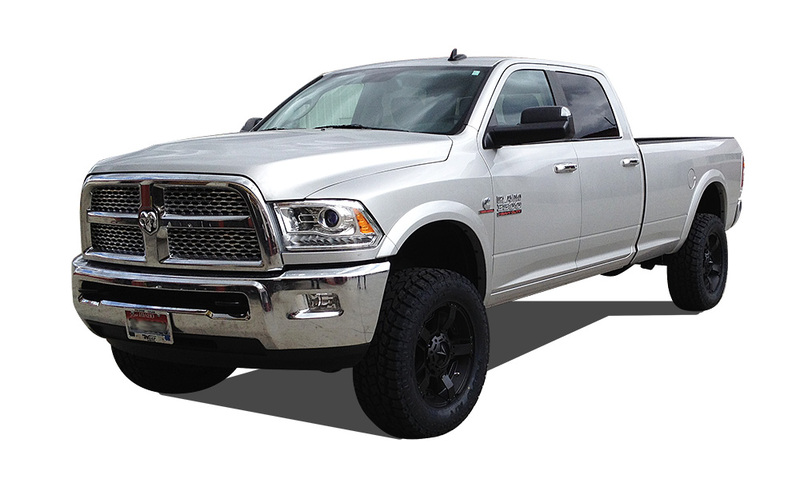 What do you offer for a 2015 ram 2500 cummins? And what is the warranty on these kits? 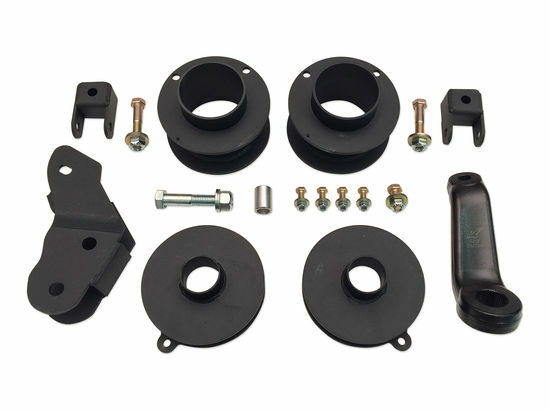 This kit will fit great with the Cummins motor. Tuff Country offers a lifetime warranty on all their products. 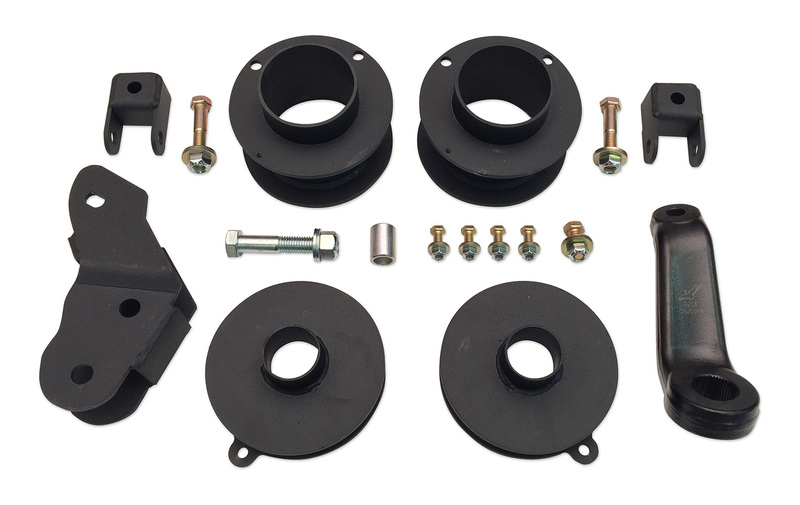 We only offer a front spacer that is either 2" or 3" you can purchase this kit without the front spacers you would just call our sales department at 800-903-2760 and tell them you want to purchase this kit without front spacers. Had to drill a hole in cross member for track bar drop bracket was almost impossible to get drill in to position between axle and cross member. Would be nice if tuff country would have used existing holes. I have always been happy with tough country lift kits and this one is no exception. This gives me just slightly more lift then everyone s leveling kit but is not to high for my daughter to get in and out of. Installation is super easy only had to drill one hole and cut the tie rod end. Took about 3 hours to install on a two post lift. I would highly recommended this to my friends clears 35 inch tires on 10 inch wide rims with negative 24 offset. Just had to trim my inner fender liners slightly. Great look and perfect for larger tires. Front kit fit up well. It required a couple holes to be drilled above the spring spacers (no big deal). Pay attention to the coil spring orientation as my passenger side needed to be rotated to the other hole for the spring to seat properly. I would recommend cutting both sides of the steering linkage (inside the adjustment coupling) for proper alignment adjustment. Be prepared to cut the factory pitman arm off or have a super heavy duty pitman arm puller at the ready. All in all an easy install. 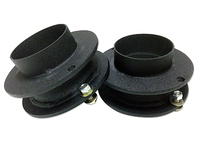 For my rear I was unable to use the spacers that came with the kit which I knew when ordering. I simply reamed the holes on the height sensor brackets to add 2" of lift then added my own set of 2" fabricated spacers. Truck was uncomfortably stiff without the spacers. Now rides great and looks awesome. The lift arrived on time. Went in pretty much as expected. Some of the bolts were too short, had to make a parts run in the middle of the project. We got the exact look we were hoping for, truck has a perfect stance. The lift is supposed to allow for 35x12.50 tires and we called the manufacturer prior to ordering the kit to verify. They were vague on the rim offset. We installed 20x12 wheels with a negative 12 offset, the tires do rub on the inside, even after trimming out some fender well. Truck looks awesome but we still have some trimming to do. All in all, I do recommend this lift. Semi-easy to install. A second person for helping hand is almost a must. 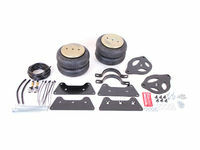 Perfect lift kit for leveling your truck out to fit 35's and have plenty of room.